Referred by their physician, patients are supervised by a registered nurse as they work toward the goal of reducing the risk of another cardiac episode or keeping an existing heart condition from worsening. 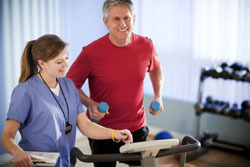 Services provided through Cardiac Rehabilitation include supervised exercise programs, assistance in reducing risk factors, and general guidance to help the patient return to a full and normal life. Most of all, Cardiac Rehab offers patients a support system they can rely upon as they work to improve their heart condition. An important part of the treatment of your specific heart problem. Generally covered by most health insurance companies, however, check your specific plan to determine copays or other requirements. Improved communication with your healthcare team about your progress following your cardiac event.